A strange hybrid is this mythical phoenix whose tradition is to rise out of the ashes. Is it a hummingbird? The snow goose with its black tipped wings that is my shamanic power animal? Yet, it has sort of duck feet and head relating it to the almost comical duck as chopping instrument in The Last Period painting done just after this one. It is certainly singing its truth, throat chakra open and clear reminding me of the bird /air cards in the Shining Tribe Tarot deck. My orange cape of power is there and the crescent moon of many European Madonna figures, as well as a shimmer of light around the wings and shoulders. Could she be Kwan Yin – the Asian goddess of compassion I fell in love with as a child?? 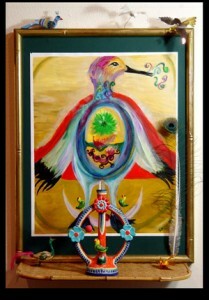 In the center lies a calm and beautiful belly with green heart chakra blooming above. A smaller more normal looking phoenix rises there above a dragon figure – fire in the belly. There is cleansing water too. Soft belly as power. 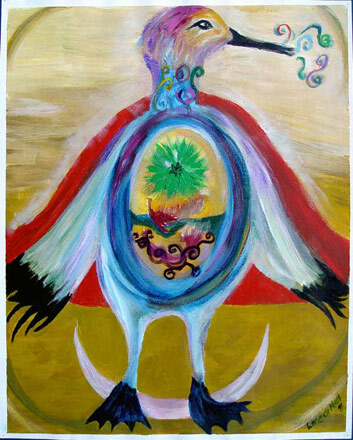 This painting is a promise – a balm to my still roiling belly and still unbirthed potentials. It is a stance I take in my very best moments. A “being” rather, than a “doing” stance. Calm and assured, I embody and thus speak my truth. I used Phoenix to practice building altars when I was getting ready for the “Out of the Ashes” Show. It sure wanted lots of birds but then birds have been omens and messengers for me all my life. It feels good to honor them. But it was the one I had the most fear about “nailing” down. It was so beautiful as it was first framed, simply in gold. Yet, I loved the synchronicity of the coloring of the painting and the candlestick. The latter came into my life a long time after the painting was done. During the show, which was dedicated to Frieda Kahlo, a friend came through and said she had given the candlestick to Cartm and that she had bought it in Mexico City around the corner from Frieda Kahlo’s house! If that didn’t give us both chills! The painting sold without the altar – back to its more simple frame. Then a couple of years later a friend called to say that she’d found the painting at Cartm so i went and bought it back. What an interesting life it has led.